I’m always happy to see an organization I admire, in this case the Ayn Rand Institute, demonstrate the power of letting information be free. 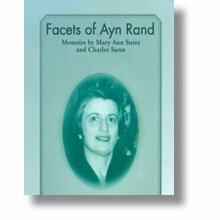 So, I’m happy to pass on news that Facets of Ayn Rand, a personal memoir about Ms. Rand is now available for no cost. Of course, the text isn’t licensed under creative commons, but the implication is that if it’s readable on the Web, it’s easy to redistribute. I own the hardcopy of this book and it’s been sitting my to-read stack for a while. I consider any money spent on books about or by Ms. Rand to be an investment, but I like the idea of skeptical people being able to get more information for no obligation. Perhaps the ARI would consider offering some of Ms. Rand’s works under a creative commons license. The decision is hard to make since the novels continue to provide a great amount of revenue for the organization. In the balance, the money probably helps spread the ideas better than if there were no marketing and only free copies. If you have never read Atlas Shrugged or The Fountainhead, I cannot recommend to you strongly enough that you do. It likely will begin a new chapter in your life.